Ma, I've got it! I've got the idea, the angle, the lead! I'll be Jewish! Why, all I've got to do is just say it. No one around here knows me. I can live with myself for six weeks, eight weeks, nine months. Ma, this is it! Gentleman's Agreement is a 1947 film starring Gregory Peck and Dorothy McGuire. Peck plays Phil "Schulyer" Green, a journalist who, having been widowed for some years, moves to New York City with his son and mother in pursuit of a new job, where he is assigned a piece on anti-Semitism. He struggles for a while to find a convincing and engaging angle from which he can write the story, and finally settles on pretending to be Jewish so he can experience prejudice first-hand. McGuire plays Kathy Lacey, his fiancee, who dislikes the difficulty this act brings, and who lacks the courage to stand up and actually confront prejudiced people. Other characters include Anne Dettrey, the fashion editor at Phil's magazine who quickly befriends him, and John Minify, the editor who suggests the piece. The title comes from the "gentleman's agreement" between the residents of a particular community not to sell or rent property to Jews. 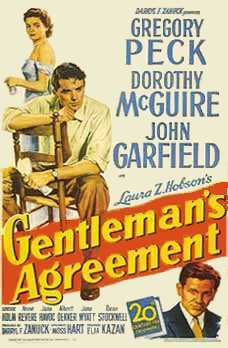 Gentleman's Agreement won the Academy Award for Best Picture in 1947, and was added to the National Film Registry in 2017. Black Like Me: The whole premise, and a fair bit older than the Trope Namer. Phil doesn't disguise himself or act differently in any way (which is part of the point, really) -- all he does is say he's Jewish -- and people treat him very differently. Informed Judaism: No part of Phil's act involves, say, attending a synagogue, or anything other than just saying he's Jewish. There is next to no discussion about what religious Jews actually believe or actual cultural traits. It's one of the stranger uses of this trope, considering. Anne Dettrey: I know dear, and some of your other best friends are Methodist, but you never bother to say it. Stop Being Stereotypical: Phil's secretary, Elaine Wales/Estelle Wilovsky. She's unhappy that she couldn't get a job under her real name, but when Phil arranges for the magazine to have fairer hiring practices, she's immediately concerned that more "kikey" Jews will ruin the job for the "good ones," like Phil and herself. Phil does not take kindly to this. Who Names Their Kid "Dude"? : Minify's opinion of Phil's pen name. He claims he wouldn't give it to a dog. This page was last edited on 3 April 2019, at 13:55.